Special Containment Procedures: SCP-1638 is contained in provisional Site-107, built on-site at █████, California. The site has been designated as a restricted wildlife preserve. A 4-meter-tall wire fence has been erected around the perimeter of the site, and security personnel posing as forest rangers are to turn away any civilians approaching the area. Personnel assigned to the site are to carry some form of personal audio reproduction equipment (MP3 players, Smart phones, etc.) at all times. Operation of any machinery or equipment which may result in sounds exceeding 85 decibels is restricted outside of testing, to prevent unintentional triggering of a Harpo event. Description: SCP-1638 designates a roughly circular forested area approximately five kilometers in diameter located in [REDACTED] County, California which is centered on the grave of Z████ Smith, a Foundation Containment Specialist specializing in acoustic SCP objects, who died on ██/██/20██ due to liver cancer. Testing of the gravesite as well as of the exhumed remains revealed no anomalous effects. Flora in area consists mostly of Monterey pines (Pinus radiate) and Blue Gum (Eucalyptus globulus) trees. 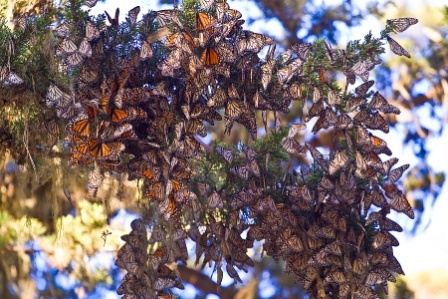 The area also maintains a population of Monarch butterflies (Danaus plexippus) which occur in numbers ██ percent higher than in similar environments; hereinafter referred to as SCP-1638-1. SCP-1638-1 do not display normal migratory behavior and remain within the area year-round, but display no individual anomalous behavior outside of a Harpo event. Individually, none of the flora, fauna, or inorganic features of the area displays any anomalous behavior or biology. However, taken collectively, the combined surface geometry of all these elements within SCP-1638 display a powerful anechoic effect - such that the ambient sound level within the area is generally no higher than five decibels. Observation and testing have revealed that SCP-1638 is capable of dynamically controlling most natural surface geometries (including leaves, forest ground detritus, and invertebrate fauna) such that sound energy is either absorbed, or destructively canceled by either another source or its own echoes. Of note, in several instances, SCP-1638 makes use of several noise cancellation techniques that have been developed exclusively for Foundation use in the containment of acoustic-based SCP objects. Any sound exceeding 85 decibels at its source which is sustained for longer than 10 seconds within SCP-1638 will trigger a Harpo event. During such an event, SCP-1638-1 within a kilometer radius of the source of the sound will display swarming behavior and congregate in an area around the disturbance. Once a critical mass of SCP-1638-1 is reached (at least 50,000), instances of SCP-1638-1 will collectively position their wings such that an amplified version of SCP-1638’s normal anomalous effect occurs. Testing shows that sound levels during such an event approach as low as -14 decibels, even when sound is generated by PA speakers. D-class personnel exposed to the event reported that they could hear only themselves, as well as mild to moderate psychological distress consistent with partial sensory deprivation. A Harpo event generally lasts approximately three hours after the disturbance. Attempts at establishing communication with SCP-1638, or ascertaining whether it has sentience, have thus far met with failure. Foundation records show that Specialist Smith grew up in the town of ████, California located ten kilometers away from SCP-1638, and investigation reveals that she had made several unsuccessful petitions whose goal was to block development of the area that currently contains SCP-1638. Specialist Smith was originally cremated and buried at the ██████ cemetery in █████, as per standard Foundation protocol for personnel with no immediate surviving family. However, her remains were illicitly exhumed and reburied at their current location by an unknown person or persons at a later date; this was not discovered until SCP-1638 came to Foundation attention despite security measures at the cemetery. Specialist Smith's original gravesite currently displays no anomalous effects, but is to be monitored for emergent effects. Text of a letter found on top of Specialist Smith's gravesite, addressed to the SCP Foundation, and signed "C█████ M███" — a person of interest whose involvement is suspected in a large number of acoustic SCP objects, ██ of which Specialist Smith was at least partly responsible for containing. I hated her at first. She contained my art, neutered it, killed it I thought. So I honed my craft, created something new and set it free - but you caught it and she caged it. Rinse. Repeat. And again. Somewhere along the line though, hate became rivalry became… honest competition. She pushed me, and I pushed her. How many monsters would be free, how many lives lost, if she hadn't learned from me? If not for her, I'd probably still be rubbing horsehair on wire. Once, I stayed, hidden, to watch her contain one of my pieces — I was still competing with her then, and I thought it would give me an edge. It was foolishness, I only understood the barest portion of her art. Instead, I realized that we'd created something new. Somewhere between my sound and her silence a new art was being born, a beautiful fractal edge of clarity. I think I fell a little in love with her then. We created many pieces together that way, though I've never been able to convince myself completely that she felt as I did about them. And now she's dead. And all you've given her for her years of service is an anonymous grave, and perhaps her name carved on a rock somewhere among countless other such names. She was a worthy adversary, a great rival, and an unmatched partner. She deserves more. Contain — or rather, preserve — this place that she loved, you owe her that much. As for myself - I'm not capable of building her a suitable monument - so I've seen to it that she's gotten a chance to build her own.